Formerly known as Muang Tranom. This town was founded in the reign of King U-thong 800 years ago. It was a big center for navigation and sea-trade and a center of Buddhist cultural arts. The name of the town was later known as Panom and Khao Nom and lastly Khanom. In the reign of King Rama the Fifth Khanom became a village under the jurisdiction of Ta-saala District. In 1959 it was upranked to the district level under the jurisdiction of Nakhon Sri Thammarat province. Foreign visitors presently have not discovered Khanom. It is still a sleepy village with fishing, rubber and coconut plantations as the main source of income. 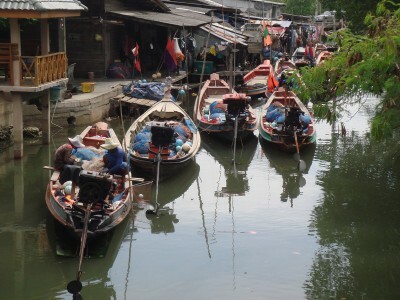 Native fishermen can still be seen around the area with small colorful fishing boats. Their catch is served up in hotel and resort restaurants specializing in a dozen of tempting choices. Getting there from Nakhon Si Thammarat and Surat Thani is no problem. Visitors can hire local taxis or travel in the air-conditioned microbus from the heart of the city of Nakhon Si Thammarat and Surat Thani right to the beach of Khanom. A direct bus leaves Bangkok twice a day to Khanom. Once you arrive at Khanom you can find plentiful accommodation ranging from luxurious hotels with swimming pools to more intimate cottages and bungalows scattered along the bays. There are small hotel in town and cottages along the beach. The town’s main attraction and even its symbol, are the dolphins. 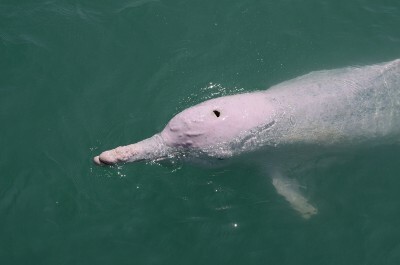 Khanom is the home of the pink dolphins, an endangered species of the indo-pacific humpback dolphins. In our resort you will see them pass by very often, or you can watch them on a boat trip along the picturesque coast, where you will meet them nearly always when the sea is quiet. If you are lucky, you will see them like in the picture . 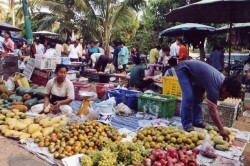 Visit the local market on Wednesdays where the farmers sell their home-grown fruits and vegetables. Markets in Thailand are also a social event and everywhere you will find people cooking, frying and eating. 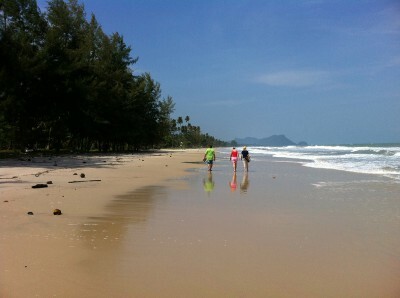 The main attractions of Khanom are the beaches and water sports: swimming and snorkeling. The seafood is fresh and delicious and you will find comfortable accommodation in hotels and bungalow resorts. You can hire a fishing boat to make a trip along the beautiful coast or to a group of small islands only some short distance offshore where corals and tropical fishes in various shapes and colors can be admired. Some visitors will enjoy a collection of handpicked shells to take home as souvenir. Some of the more enterprising visitors may try a little deep-sea fishing to the islands . Nadan Beach is a quiet long narrow beach with white sand surrounded by coconut trees. Thong Yi Bay is located between two mountains. This narrow, extensive, circular beach has fine sand and picturesque rocks, and is excellent place for swimming and rests since it is isolate and quiet. Thong Yang Bay is a little bay in the southernmost of Khanom with a large area for swimming. It is calm and quiet place, good for relaxing. The road to Thong Yang Bay is 6-7 kilometres from the main road. Wat Kradangnga is an ancient temple of Khanom that was probably built during the Ayutthaya period. The temple is about 200 meters away from the Khanom-Nai Phlao road. Inside the convocation hall are exquisite murals of Lord Buddha’s life. There is also a magnificent Buddha statue from the Ayutthaya period and interesting artefacts, particularly plates and bowls.